As the cooler months approach, many inshore gamefish will move into the shallow grassflats throughout the St. Joseph Sound. 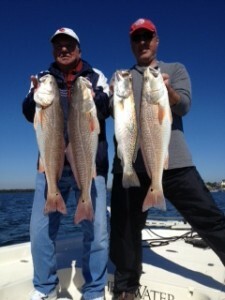 Speckled Trout and Redfish will lay up in skinny water to hunt baitfish, shrimp and other crustaceans that are the major part of their Winter diet. The water along oyster bars and shallow docks will be filled with a buffet of food and become prime staging grounds for these predatory fish to lay in ambush. The southern facing edges will also hold heat better on cooler mornings and allow for some great sightfishing opportunities. Live select shrimp, Pumpkin Jig Slammrs and MirrOlure MirrOdines are great baits for targeting these species. The spoil islands along the intracoastal waterway are key target areas on lower winter tides , as 100’s of fish will stack up to feed on moving tides. It is a great time of year to get family and friends out and enjoy the Florida weather along our Gulf Coast. – Superbraids in eight pound test, are equivalent to 2 pound mono and can be cast farther when rigged properly on a spinning outfit. A tail-hooked, select shrimp will be weight forward and cover more distance on the cast. 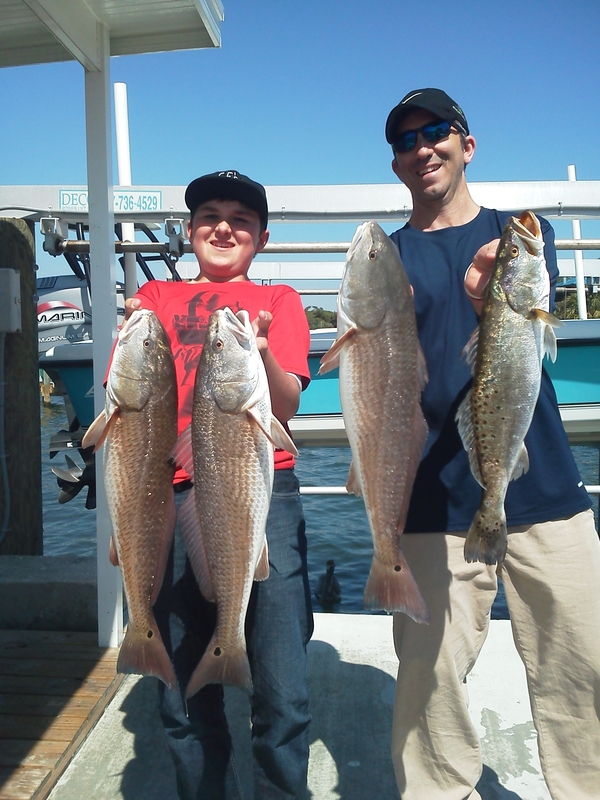 Fifteen pound fluorocarbon leader can also help on cautious fish in the clear waters off Pinellas county. 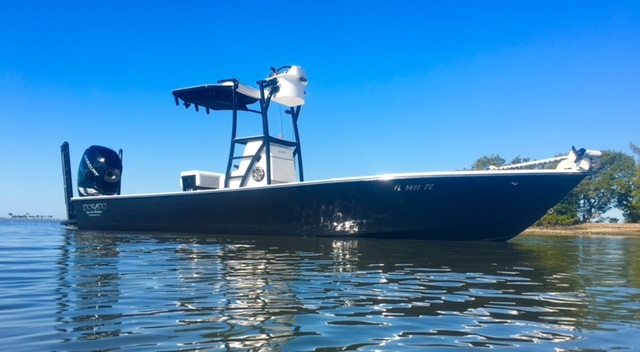 What’s Hot- The extreme high tides of summer will find most gamefish using the mangrove trees to hunt and keep cool during the heat of the day. Certain shorelines will be more productive than others as many factors play into why that stretch of trees holds more fish. 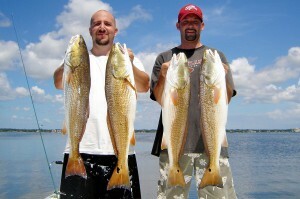 Tide and water movement is the main reason that redfish and snook will favor a given area. As water pours into the passes, the nearest flats that have mangroves will be richest in bait and cructaceans. Oyster bars with deeper cuts among them will create a pathway for these fish to travel as the the water height increases. Reds are most aggressive during this lower water, as they will push up very shallow and corner baits in pockets or shallow edges. Anglers can also use the lower water, to find the undercuts of the mangroves that will create deeper pockets and key ambush areas. These little caves among the trees are the reds favorite spots to frequent. When fishing a treeline, the cast must fall right on the edge of the shade, due to the fact these fish rarely come out and feed at peak tides. When the tide turns, keep an eye on the mullet , as this is an indicator where the fish will fall out of the trees. Snook will sit on the points that protrude most and flush more bait by. Bait tip- Smaller silver dollar sized pinfish are like candy for redfish working the brush. Use a smaller split shot and tail-hook these baits to allow them to swim tight to the cover. What’s Hot- With south winds throughout the week and a new moon, the tides have been higher than normal. This increased water level has lead to flooded mangroves and schools of redfish hunting among the roots in places deep in the woods. Fishing earlier in the tidal phase will give anglers a better chance of locating these bronze bruisers and set up a pattern of where they may hold. Finding the mullet schools among the trees will play as a key indicator of a redfish haunt. The mullet will stir up baby stone crabs, bloodworms and small pinfish as the schools works along the mangroves. Cutbait , such as ladyfish, works well on reds holding in the trees and on top of oyster bars. Fish the overhangs or pockets where a cast deep into the mangroves allows. Be sure to “deadstick” or not move the offering , as this will allow the scent to travel deeper into the cover and draw out more fish. Thirty pound leader is necessary to help prevent breakoffs. The snook have moved onto the beaches and are feeding great with moving water. The early part of the incoming or the middle of the outgoing tide will bring the best bite for anglers. Sardines have been the top choice to persuade these linesiders to eat. Light chumming will turn the bite on, as these fish have not seen much whitebait, yet. 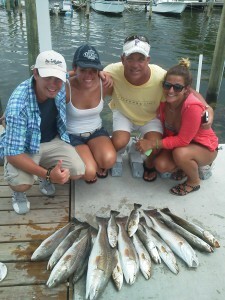 The speckled trout have started to move towards the beaches and jetties. Many of the larger females are sitting tight to the swash channels or rocks and feeding best on the very beginning of the incoming tide. Using a split shot about two feet up the line will keep the sardine along the bottom in the hot zone. With springtime patterns emerging along the west coast , many inshore species will use the shallowest water to hunt down a meal. As the water warms up, pinfish, sardines and other bait become a reliable food source for the big three – snook, redfish and trout. There are two key factors that anglers can look for when finding fish. One – Look for birds picking around shallow flats on low water. Egrets and spoonbills will root around the most productive areas that have bloodworms and small crabs. Often times this area is the very shallowest section of the grassflat. These crustaceans are favorites of redfish and the bottom feeders will work that zone once the tide begins to flood. Two- work around mullet schools on high water. In the early spring, these schools will flush up the bottom as they work up towards the mangroves. The result becomes a massive buffet line for predators searching for an easy meal. Gold spoons and scented plastic shrimp are the best artificial offerings, as anglers can work the lures near the bottom. For live bait – shrimp and silver-dollar sized pinfish rigged with a small split-shot just above the hook will keep the bait down – where gamefish will be targeting. As the water starts to warm up this month, schools of redfish and the largest trout of the season will move into the shallows and feed among the mullet. Incoming tide has these gamefish chasing bait in the skinniest of water. As the redfish will often tail to feed on crabs and grass shrimp, they will push around wakes when attacking small silver-dollar pinfish. Late February will find redfish schools hunting along the oyster bars on the higher tides. With high pressure and minimal clouds after a front, anglers will have more luck with cut bait along the bars when the fish are timid. On windy days (pre-front) throwing gold spoons among the mullet schools has been very productive. Work all levels of the water column to locate where the reds want to hold. Big gator trout have finally started to hold on the grassflats that have less boating pressure. Though these yellowmouth predators can be spooked easier in shallow water, long casts with darker colored jerkbaits has rewarded anglers with quality fish. Drift fishing will cover more water and allows great sightcasting opportunities. Work the sandy potholes, as these key ambush zones will attract good numbers of trout. Once a fish is hooked, be sure to anchor for a short time as there may be more nearby. Tackle tips- With the extra clear waters off St. Joseph Sound, 15 pound fluorocarbon leader has worked best to help disguise the presentation offered. 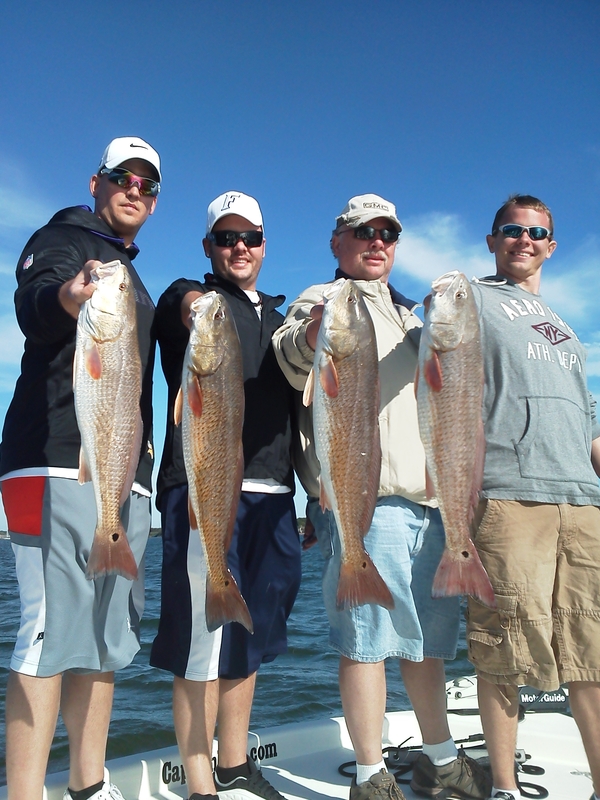 Long casts and patience will catch the larger redfish roaming around right now. With cooler water temperatures settling in along the coastline, larger speckled trout have started to hold in the shallow grassflats. Depths of 1 to 3 feet has been the primary target for anglers wishing to sight cast these hard fighting fish. As the tide floods, trout will move into the skinniest water seeking refuge and warmer water. The lower water column will also funnel baitfish, crabs and other crustaceans into edges and easier ambush spots. Stealth is key to convince these predators to feed on the offerings tossed their way. Use a push pole or trolling motor to work into the flat. Artificial offerings- The fish that are holding shallow in the early part of the tide are weary of excess noise.Pumpkin Jig Slammr jerkbaits in motor oil or turtlegrass green rigged weedless are working well in low tide conditions, where a lighter entry to the water is needed. On higher water (2-3 feet), soft suspending lures – Mirrolure Paul Browns and Mirrodines – are working well. The key to working these newer plugs is slowing down the retrieve, to allow the sliding action that brings the strike. By throwing artificials, anglers can cover more water as they methodically work across a flat. The use of lighter braided line, 10 pound test, will add more distance on each cast. Low Water Redfish- On extreme low tides around the stronger moon phases, many shallow flats become exposed and reveal potholes and edges that are prime ambush zones for redfish. The sandy depressions are easier to spot and allow for great sightcasting from a distance. Live shrimp or scented plastics will consistently get bites. The best method is to deadstick the offering in the hole. What’s hot- With passing cold fronts over the next few months, many shallow areas will become havens for fish seeking warmer waters. South facing shorelines will warm quicker in frosty mornings, as the sun travels over the southern skyline. These flats are also protected from north winds and will sustain heat longer. Speckled trout and redfish will lay up in sandy potholes and become opportunistic feeders- meaning that easy meals that cross through these feed zones will get eaten. Soft plastics work great for this time of year as they can often times be worked at all depths of waters and are eratic in action. Darkers colors in rootbeer and turtlegrass green have a tendency to blend in with the terrain and help disguise the offering. Downsizing tackle is key during the winter months as the water is extremely clear. Ten pound braided line combined with 15-20 pound fluorocarbon leader works best as it allows long casts and a stealth presentation. When live baiting, try to get select shrimp from tackle shops , when available, to fish with. Tail-hooking the shrimp will allow the weight forward and make extra long casts to weary gamefish. Finding Fish- Two of the most important tools in wintertime sightfishing for inshore gamefish are polarized glasses and a quiet mode of transportation. Use of a trolling motor or a push pole will allow anglers to quietly work a flat or edge where fish will lay up. Be sure to always have the sun at your back when possible, as this makes it much easier to spot the desired species. On low tides work the dropoffs of flats , as many fish will hold there to ambush prey in condensed zones.